Accusing Narendra Modi of violating the Model Code of Conduct by referring to Balakot air strikes, Punjab chief minister Amarinder Singh on Wednesday moved the Election Commission seeking action against the prime minister. Terming Modi's reported speech in Maharashtra, “shockingly disgraceful”, the chief minister said it was “a clear case of violation of the code of conduct, which constitutes the bedrock of free and fair election”. The Election Commission on Wednesday issued notification for the fifth phase of Lok Sabha elections to be held on 5 May in 51 seats across seven states. In this phase, the least number of constituencies are going for polls as compared to other phases. The seven-phase elections begins 11 April and will end on 19 May. 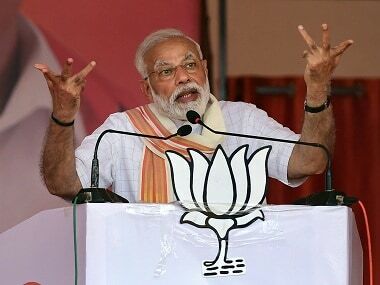 "The Congress' hand (symbol) knows either to clean the government treasury, or knows to run the government with remote control," Narendra Modi claimed at a rally in Panaji on Wednesday. "Forced government suits them, because they can arbitrate there." In Goa's Panaji, Prime Minister Narendra Modi, "During Congress tenure, every defence deal was shady. They took kickbacks in Bofors and Quattrochi was allowed to flee. For decades, our armed forces didn't get a new weapon because nobody wanted to be involved in scams. The result was the deals were stalled for years." In Panaji, Prime Minister Narendra Modi said, "During Manohar Parrikar's tenure as a defence minister, we carried out surgical strikes. It laid the foundation for a new culture where India can enter the homes of enemies to kill them." AAP welcomed the decision on Twitter and said that the Election Commission move was based on its complaint against the channel. While poll panel officials have confirmed to media outlets that the order on PM Narendra Modi biopic is applicable to NaMo TV, the commission is yet to make an official announcement. NDTV reported that the order on NaMo TV will be available on the EC website soon. Addressing a rally in Raiganj, Rahul Gandhi said, "Narendra Modi wants to create two Indias — one for people like Anil Ambani and the other for the poor people. But there will be one India (under Congress) which will ensure that the money goes into into education and building better hospitals." He further said, "After the election, when Congress will form the government. Today the Supreme Court has said that there was theft in Rafale. 'Kuch na kuch daal mein kaala hai, investigation to karna padega'. The country will get justice." Sources in the Election Commission were quoted as saying by NDTV, that the poll panel's order on 'PM Narendra Modi' biopic is also applicable to NaMo TV. The paragraph "10.2" of the EC order categorically clarifies that NaMo TV is violative of the Model Code of Conduct, it reported. "We all know Congress president probably doesn't even read even half a paragraph, but here, by saying that the court has accepted and by also saying that the court has said 'chowkidaar chor hai,' these (statements) verged on contempt of court," said Union minister and BJP leader Nirmala Sitharaman. Earlier on Wednesday, the Supreme Court allowed the "leaked" Rafale documents to be relied upon by petitioners, and dismissed the government's preliminary objections claiming "privilege" over them. Actor Vivek Oberoi, who is playing Narendra Modi in the biopic on the prime minister, cancelled a scheduled press meet in Nagpur on Wednesday after the Election Commission banned its screening during poll period. The EC's order came a day before the film was to be released. Oberoi was scheduled to speak to media-persons in Maharashtra's Nagpur in the afternoon, but he cancelled the meet after the EC announced its order. In Katihar, Rahul Gandhi said, "This country is not full of chowkidars; there are farmers, labourers, small business owners. You've destroyed the lives of many with demonetisation, and Gabbar Singh Tax. This is why we're bringing in NYAY scheme. And this is still the beginning. I am not Anil Ambani's chowkidar, I work for the people." 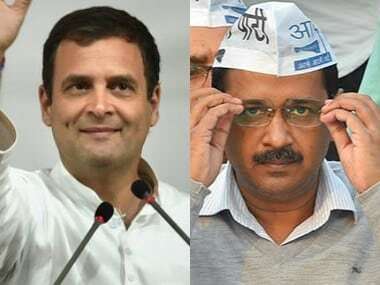 Bringing back his 'chowkidar chor hai' jibe to target Narendra Modi, Congress president Rahul Gandhi said in Bihar's Katihar, " Let both of us, Rahul Gandhi and Narendra Modi, debate on corruption. Whatever you want to speak on the topic, you speak. And give me 15 minutes to speak on Rafale." Senior Congress leader Ahmed Patel arrived at the residence of Delhi Congress chief Sheila Dikshit. The details of the meeting are yet to be known. Congress spokesperson Sanjay Jha targetted actor Vivek Oberoi after the Election Commission stalled the release on PM Narendra Modi. "#VivekOberoi was jobless. Now he is unreleased," he tweeted. Student activist Umar Khalid took a dig at the makers of PM Narendra Modi and said, "Let's observe one minute silence for the hard work of 'Chatukar' Vivek Oberoi," he said. On a day her brother Congress president Rahul Gandhi filed his nomination for the Lok Sabha elections from Amethi, Priyanka Gandhi Vadra said the constituency was her father's "karmabhoomi" and its land was sacred for her family. Rahul's mother Sonia, sister Priyanka and brother-in-law Robert Vadra accompanied him for his filing of nomination. "Some relationships are from the heart. Today, the whole family was present for my brother's nomination. This was my father's 'karmabhoomi', it is sacred land for us," Priyanka Gandhi tweeted. In a counter to 860 intellectuals and artistes writing a joint word of caution against Narendra Modi and the BJP, 907 others on Wednesday issued a joint statement speaking for the Modi government's re-election. "We, creative artistes and persons belonging to the field of literature appeal to all our fellow citizens to caste their vote and exercise their right to elect the new government without any pressure and prejudice," the statement, issued by the Nation First Collective said. "We believe that during the last five years, India has seen a government that has delivered corruption-free good governance and development oriented administration...we need a majboot sarkar and not a mazboor sarkar and hence we need the present government to continue," it read. Andhra Pradesh chief minister Chandrababu Naidu on Wednesday asked the Income Tax department "who it was to carry out one-sided raids." This came after a TDP delegation visited the EC over raids on its leaders. "Once elections are announced, it's a level playing field. You have to treat everybody equally. Otherwise, it's unjustified. Modi wants to demolish democracy," he added. PM Narendra Modi, speaking in his second campaign rally of the day, at Gujarat's Songarh, spoke mostly in Gujarati. He, however, repeated bits of his Junagarh rally in the morning, to slam the Congress, saying that it was a proponent of the 'Tughlaq Lane scam' and that it has stolen heavily from schemes meant for pregnant women. "If Sardar Patel saw the Congress's dhakoslapatra, do you think he would accept it?" he asked. The Congress has said, 'Modi hatao' but Modi has only said, 'garibi hatao'. Key portions of the Election Commission's take on banning the release of PM Narendra Modi are those where it observed that the release of the film goes against the MCC. Opposition parties, including the Congress, had held that the movie would give undue advantage to the BJP in electioneering, and its release should be deferred till the elections conclude. The Election Commission's order comes a day before the first phase of the Lok Sabha polls is set to begin on Thursday, the same day PM Narendra Modi was scheduled for release. In its order, the poll panel ruled that the biopic should not be shown in cinemas or electronic media till the completion of the polls. Joint Resistance Leadership, an alliance of top ranked separatist leaders of Kashmir, including Syed Ali Shah Geelani, Yasin Malik and Mirwaiz Umar Farooq, has called for a shutdown across the Valley on Thursday, against the Lok Sabha polls, in reaction to the NIA's arrest of Yasin Malik earlier on Wednesday, reported Greater Kashmir. 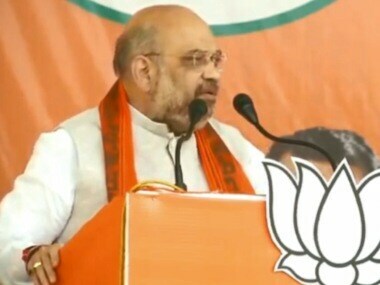 Speaking in his second rally of the day, at Uttar Pradesh's Firozabad, Amit Shah said the SP and BSP governments had "never bought" the wheat produced by farmers and that it was Yogi Adityanath's government which bought farmers' produce at 1.5 times the minimum support price. He said the Narendra Modi government has brought out "133 schemes which are for the poor" and aim for the welfare of Uttar Pradesh. The Election Commission has banned the release of the Narendra Modi biopic, PM Narendra Modi, calling biopics "surrogate publicity." The poll body also held that "such political content ought to be regulated." Two other biopics have also been banned. A delegation comprising Trinamool leaders Derek O'Brien, Sukhendu Sekhar Roy and Chandan Mitra held talks with the Chief Election Commissioner in New Delhi on Wednesday. Once the meeting was over, O'Brien said that it was high time the EC took notes of the behaviour of the ruling party. "Young India is very sharp. You (the BJP government) have not delivered on anything. Nirvachan Commission is now Nikamma Commission. We had a strong word with the EC today. Enough is enough," O'Brien said. Following the crackdown on political leaders in Madhya Pradesh and Karnataka, and the Opposition's repeated insistence that this is political vendetta of the ruling BJP, finance minister Arun Jaitley wrote another Facebook post on Wednesday, saying, "It has become a growing culture of opposition parties to call any action against corruption as political vendetta. Legitimate action against corruption is no vendetta as claim of vendetta has never been a legitimate defence in corruption." Shortly after Congress chief Rahul Gandhi pronounced that the SC's Rafale order had proven that the "chowkidar" is a "chor," Congress's communication in-charge Randeep Singh Surjewala held a press conference slamming the "lies of the prime minister on Rafale". "The entire structure of lies propagated by PM Modi is in tatters now. Today SC has demolished the lie of the initial clean chit behind which Modi would hide for years. First Modi government said the CAG report had given them a clean chit, the SC followed the report and pronounced its verdict. We then found out that no such report existed. Modi government hid crucial facts regarding the Rafale deal," he said. "The PM was directly negotiating the price, this was hidded from the Supreme Court. He superceded the written opinion of several ministries with regards to securing a sovereign guarantee from France and Dassault Aviation. This made Dassault richer by several crores, the CAG itself has said," Surjewala added. After filing his nomination papers at the Amethi Collectorate, Rahul Gandhi spoke briefly to reporters, calling the Supreme Court's Rafale order, dismissing the Centre's objections to the admissibility of the "leaked" papers regarding the case, a "victory" for the Congress. "Everyone knows that the chowkidar, who by the way refuses to engage in debate with me, is a chor. We have been vindicated now," he said. "The SP-BSP had harassed the people. The Yogi government has punished these goons. The BJP government is working to enforce law and order in Uttar Pradesh," Amit Shah said in Kasganj on Wednesday. Uttar Pradesh Chief Minister Yogi Adityanath will be visiting Amethi Thursday where he will accompany Union minister and BJP candidate Smriti Irani, who will be filing her nomination papers, a party spokesperson said. The chief minister will also participate in a road show before the nomination and later address an election meeting, BJP's Amethi media in-charge Govind Singh said. Irani was to file her nomination on 17 April, but since it is a holiday, she will now file the papers on 11 April. Congress president Rahul Gandhi is filing his nomination from Amethi. Sonia Gandhi, Priyanka Gandhi Vadra and Robert Vadra are also present at the Collectorate. The Election Commission has told the Supreme Court that it is not against the issuance of electoral bonds for funding to political parties but that it is against the anonymity of donors and wants transparency in the bonds scheme, reported ANI. “We are not opposed to the electoral bonds as such, as it will legalise donations. We want transparency,” advocate Rakesh Dwivedi, appearing for EC, told SC duringthe hearing of pleas against issuance of electoral bonds. UPA chairperson Sonia Gandhi, who was not present at the roadshow of Congress president Rahul Gandhi, has arrived at the Amethi Collectorate. Gujjar leader Kirori Singh Bainsla and his son Vijay Bainsla joined the Bharatiya Janata Party in the presence of Union HRD minister Prakash Javadekar. Watch as Congress president Rahul Gandhi holds a roadshow in Amethi. Congress general secretary for Uttar Pradesh East, Priyanka Gandhi Vadra, along with her husband Robert Vadra, son Raihan and daughter Miraya are also present. Uttar Pradesh's Amethi got into carnival spirit with Congress chief Rahul Gandhi's roadshow proceeding through Munsiganj amidst drumbeats and showers of flower petals. Rahul is accompanied by sister Priyanka, brother-in-law Robert Vadra, and his niece and nephew. The Amethi seat has generationally belonged to the Congress, and the presence of the minor children goes a long way towards propagating that idea. The Congress is eager to put up a show of strength, seeing that the BJP's candidate Smriti Irani has been scathing in criticism of Rahul's absence from the constituency. Gujjar leader Kirori Singh Bainsla is expected to join the Bharatiya Janata Party today. Bainsla is a retired Lieutenant Colonel of the Indian Army and in 2007 led a caste protest movement in the state of Rajasthan. All eyes are on Amethi as Rahul Gandhi's roadshow looks to begin any time now. Rahul will proceed through three kilometres before arriving at the Collectorate to file his nomination papers. A day ahead of the first phase of the Lok Sabha elections, Gujarat’s OBC leader Alpesh Thakor quit the Congress on Wednesday morning, News18 reported sources as having said. Thakor, only last month, had rubbished all rumours that he would jump ship to join BJP and said that he would continue to fight for the rights of the Thakor community within the Congress fold. 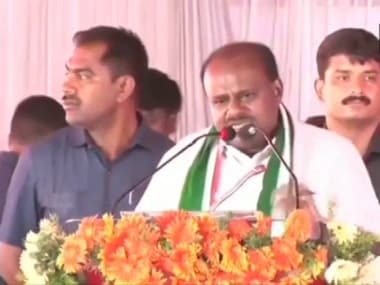 While admitting that he was angry with the leadership, the OBC leader said, “I will stay with Congress and will continue to support this party. I want respect and rights for my people." He further indicated that he will not contest the upcoming elections. The Jammu and Kashmir Liberation Front chief, who was shifted to Tihar jail under police protection, was taken into preventive custody in February by the Jammu and Kashmir police and shifted to Jammu's Kot Balwal jail. Alternating between Hindi and Gujarati, Modi said on Wednesday that the Congress's only agenda was to remove him. "The Congress today is hurting the dreams of Sardar Patel as well as every Hindustani," he added. "We have a 'track record', they have a 'trap record'," said Narendra Modi, speaking in Junagarh on Thursday. The prime minister amped up the attack on the Congress 'family', alleging that the party has only looted people and was known for its hatred of Gujaratis. He also said repeatedly that if Sardar Patel was the prime minister instead of Nehru, he would have done a much better job. "Congress has stolen from the mouths of hungry children to fill the pockets of their own leaders. The party has stolen money from schemes meant for pregnant women," Modi said. Congress has made Karnataka, Madhya Pradesh its own ATMs, the PM insisted. "Maybe the situation will be the same for Rajasthan," he said, referring to the whole thing as the 'Tughlaq Road election scam'. Speaking in his home state of Gujarat, at Junagarh, Narendra Modi said he was here to seek guidance for the next five years. "No stain of corruption besmirched my name in the last five years, I am sure you are proud of your son," he said. The Congress party released the list of its star campaigners for the elections in Rajasthan on Tuesday. Apart from Congress president Rahul Gandhi and United Progressive Alliance (UPA) chairperson Sonia Gandhi, general secretary Priyanka Gandhi Vadra will also campaign in Rajasthan for 25 Lok-Sabha seats. The Chief Ministers of Congress-ruled states are also on the list of the party's star campaigners. The Congress has been fielding only its very well-known faces as campaigners this election season. The only new entrants among star campaigners in the state were new joinees Hardik Patel and Shatrughan Sinha. The Election Commission is learnt to have directed the Chief Electoral Officer of Delhi on Tuesday to ensure that the contents of NaMo TV are pre-certified by the local media certification and monitoring committee. Such committees are formed at district and state levels during polls. They clear political campaign and advertisements. Last week, the Commission had issued a notice seeking a report from the I&B Ministry on NaMo TV, launched just weeks ahead of general election, after opposition parties, including the Congress, asked the poll body to direct the ministry to suspend the channel in violation of the Model Code of Conduct. Senior Congress leader P Chidambaram Wednesday took a swipe at the Modi government, charging that in this regime conviction comes first and investigation later and a person is guilty until proven innocent. He said the law secretary should "teach" the prime minister some basic lessons in law as the Supreme Court has said that bail is the rule and jail the exception. Chidambaram's jibe at the prime minister came in the wake of Modi's attack on the opposition leader. At a recent rally in Tamil Nadu, Modi had said he was "shocked to read the recounting minister headed their manifesto committee. I was not surprised. After all, getting bail is important for his own existence," apparently referring to cases against Chidambaram and his son Karti. The Amethi Collectorate has already been decorated, presumably by Congress workers, ahead of Rahul Gandhi filing his papers there later on Wednesday. Rahul has reached the Munsiganj guesthouse with sister Priyanka Gandhi Vadra, brother-in-law Robert Vadra and their children. He will lead a roadshow before filing papers at the Collectorate. A three-member Trinamool delegation, led by party leaders Derek O'Brien, Sukhendu Sekhar Roy and Dr Chandan Mitra will meet the chief election commission at around 11.30 am. The mortal remains of BJP MLA Bheema Mandavi were brought to the party's office in Dantewada. The MLA, his driver and three personal security officers lost their lives in a Maoist attack in Dantewada on Tuesday. ANI has tweeted visuals from Dibrugarh, from where polling parties have left for their respective polling stations. Five Parliamentary constituencies of Assam will undergo polling tomorrow, in the first phase. A team of Income Tax dept conducted a raid at a private hotel in Karnataka's Ballari late last night, where former MLA and Congress leader Anil Lad is staying. Congress leader Sanjay Jha, took the BJP trolling one step further by declaring that there is a "secret love story." Prime Minister Narendra Modi's repeated calling out to voters in the name of the Army and the Armed Forces has drawn criticism from quarters. The latest to join in was actor Siddharth, who often comments on social issues on Twitter. Siddharth asked the Election Commission to take note of Modi's mention of the Pulwama martyrs. Pakistani prime minister Imran Khan's observation that there may be a better chance of peace talks with India if Prime Minister Narendra Modi’s Bharatiya Janata Party (BJP) wins the polls has drawn criticism from the likes of National Conference leader Omar Abdullah, who slammed the BJP's insistence that those wishing for the party's loss are sponsored by Pakistan. "So much for Modi sahib telling the country only Pakistan and its sympathisers want BJP to lose," Abdullah tweeted. Pakistani prime minister Imran Khan said he thinks there may be a better chance of peace talks with India if Prime Minister Narendra Modi’s Bharatiya Janata Party (BJP) wins the general election, due to begin on Thursday. Khan said that if the next Indian government were led by the opposition Congress party, it might be too scared to seek a settlement with Pakistan over disputed Indian-controlled Kashmir, fearing a backlash from the right. “Perhaps if the BJP - a right-wing party - wins, some kind of settlement in Kashmir could be reached,” Khan told a small group of foreign journalists in an interview. Actor Swara Bhasker, ahead of the first phase of the general elections, flew to Patna on Wednesday to lend support to CPI candidate Kanhaiya Kumar. Bhasker is expected to campaign for him in Bihar’s Begusarai district. Bhasker has often been on the receiving end of merciless trolling on social media, where she is often critical of the ruling BJP dispensation. Polling parties have departed with EVM nachines for their respective polling stations in Alipurduar parliamentary constituency. Alipurduar, along with Cooch Behar, will go to polls on Thursday. 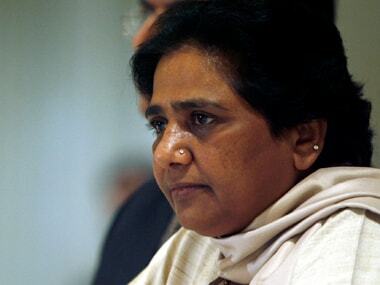 In a move which can upset the BSP-SP-RLD alliance in Uttar Pradesh, Dalit group Bhim Army, which has a considerable following in western Uttar Pradesh, has appealed to members of the community to vote for Congress' Saharanpur Lok Sabha candidate Imran Masood. Prime Minister Narendra Modi is scheduled to address rallies in Junagarh and Songarh in Gujarat, before heading to Panjim in Goa. BJP chief Amit Shah will speak at Kasganj and Firozabad in Uttar Pradesh. Congress chief Rahul Gandhi, who filed his nomination papers from Wayanad in Kerala amid much fanfare on 4 April, will file his nomination from Amethi in Uttar Pradesh on Wednesday. He will begin with a roadshow around 10 am from Amethi's Munshiganj and is expected to reach the Collectorate at noon. His sister and Congress general secretary Priyanka Gandhi is expected to accompany him, as is his mother and UPA chairperson Sonia Gandhi. Jannayak Janata Party leader Dushyant Chautala on Wednesday said his party is in the process of forging an alliance with "like-minded outfits" to contest the Lok Sabha polls and an announcement in this regard will be made within four days. The Hisar MP said a three-member panel of JJP that includes KC Bangar, SS Kadian and state unit chief Nishan Singh has prepared a report which will be discussed with party patron Ajay Chautala, who will take a final call on the tie-up issue. He indicated that the Aam Aadmi Party could be onboard among the like-minded parties, while some smaller outfits, who may not put up candidates to fight the Lok Sabha polls, could also be among those to extend support to the JJP. Dushyant Chautala said only one member from his family will be contesting the general election. Karnataka housing minister MTB Nagraj danced with his supporters to a popular tune while campaigning in Hoskote. #VivekOberoi was jobless. Now he is unreleased. EC bans Modi's biopic today. Lets observe one minute silence for the hard work of 'Chatukar' Vivek Oberoi. Security personnel on Wednesday, cast their vote through the postal ballot at Coimbatore, in Tamil Nadu. National Conference leader Farooq Abdullah also came down heavily on Yasin Malik's arrest by the NIA on Wednesday. "I regret to say the NIA will not find anything. The more you redden your eyes on them, the more the fire will rage. People can differ, this does not mean that you stop them on their tracks," he said. After dealing with rounds of criticism on ignoring complaints that go against the BJP government at the Centre, the Election Commission on Wednesday announced that it was going to ban the release of the Vivek Oberoi-starrer film PM Narendra Modi. On complaints against movies NTR Laxmi, PM Narendra Modi and Udyama Simham, the EC said, "These have potential to affect the level playing field which is in consonance with Model Code of Conduct and these should not be displayed in electronic media when the MCC is in force," it held. In the public space evidence has come from Karnataka where allocations made to the PWD for public welfare were being round-tripped by engineers for a political purpose. Similarly in Madhya Pradesh, an institutional mechanism has been created where money that is meant for development & social welfare of the weaker sections are now being channeled into politics. "In the 13th Finance Commission, the Congress government had given Rs 3,30,000 crore to Uttar Pradesh. The BJP government gave Rs 10,27,323, crore rupees under the 14th Finance Commission," Amit Shah said. He also said the anklet and belt-making industries of Etah and Aligarh have been revived by the BJP government. "The BJP has brought freedom from the system of "Nizam". From Nasimuddin Siddique, from Mukti Imran Masood, from Mukti Azam Khan and Mukti Ahmad," he added. Narendra Modi in Goa; Lok Sabha Election 2019 LATEST updates: Addressing a rally in Goa's Panaji, Prime Minister Narendra Modi lashed out at the Congress over scams under the UPA rule. "The Congress' hand (symbol) knows either to clean the government treasury, or knows to run the government with remote control... Forced government suits them, because they can arbitrate there," he said. The Election Commission's order banning screening of PM Narendra Modi biopic during poll period also applies to NaMo TV, which cannot be aired, a poll panel official told PTI. AAP welcomed the decision on Twitter and said that the move was based on its complaint against the channel. Congress president Rahul Gandhi claimed on Wednesday that the Supreme Court has said 'chowkidar chor hai' by dismissing Centre's preliminary objections to review petitions in the Rafale deal case. BJP leader Nirmala Sitharaman hit back, saying, "We all know Congress president probably doesn't even read even half a paragraph, but here, by saying that the court has accepted and by also saying that the court has said 'chowkidaar chor hai,' he verged on contempt of court." Congress spokesperson Sanjay Jha targetted actor Vivek Oberoi after the Election Commission stalled the release of biopic PM Narendra Modi. "#VivekOberoi was jobless. Now he is unreleased," he tweeted. The Election Commission has stalled the release of the Narendra Modi biopic, PM Narendra Modi, calling biopics "surrogate publicity." In case of any violation or receipt of complaints in this regard, the EC has formed a committee which will examine the said violation and suggest an appropriate action. The poll body also held that "such political content ought to be regulated." The film's main actor, Vivek Oberoi, had campaigned fervently in its favour. Two other biopics have also been stalled. BJP president Amit Shah said in Kasganj on Wednesday that the SP and BSP governments in Uttar Pradesh had harassed the people of the state for years. "The Yogi government has punished these goons by hanging them upside down. The BJP government is working to enforce law and order in Uttar Pradesh," Amit Shah said in Kasganj on Wednesday. Congress chief Rahul Gandhi, accompanied by sister Priyanka, brother-in-law Robert Vadra, his niece Miraiya and nephew Raihan, arrived at the Amethi collectorate to file his second set of nomination papers for the Lok Sabha elections. Rahul's mother and UPA chairperson Sonia Gandhi arrived earlier at the venue. The Election Commission has told the Supreme Court that it is not against the issuance of electoral bonds for funding to political parties but that it is against the anonymity of donors and wants transparency in the bonds scheme. “We are not opposed to the electoral bonds as such, as it will legalise donations. We want transparency,” advocate Rakesh Dwivedi, appearing for EC, told SC duringthe hearing of pleas against issuance of electoral bonds. UPA chairperson Sonia Gandhi, who was not present at the roadshow of Congress president Rahul Gandhi, has arrived at the Amethi Collectorate. Rahul is accompanied by sister Priyanka, brother-in-law Robert Vadra, his niece Miraiya and nephew Raihan. The Amethi seat has generationally belonged to the Congress, and the presence of the minor children goes a long way towards propagating that idea. All eyes are on Amethi as Rahul Gandhi's roadshow at Munsiganj looks to begin any time now. The Congress chief's roadshow will proceed through three kilometres before arriving at the Collectorate to file his nomination papers. He is expected to be accompanied by sister Priyanka Gandhi Vadra and brother-in-law Robert Vadra. Speaking at Junagarh in Gujarat, Prime Minister Narendra Modi said the Nehrus and Gandhis have only had contempt for Gujarat and sought to highlight the scams surrounding its leaders. "Congress has stolen from the mouths of hungry children to fill the pockets of their own leaders. The party has stolen money from schemes meant for pregnant women," Modi said. Prime Minister Narendra Modi is scheduled to address rallies in Junagarh and Songarh in Gujarat, before heading to Panjim in Goa. BJP president Amit Shah will be in Kasganj and Firozabad in Uttar Pradesh. UP will see a day heavy with poll campaigns, thanks to Rahul Gandhi's presence in Amethi as well. Congress chief Rahul Gandhi, who filed his nomination papers from Wayanad in Kerala amid much fanfare on 4 April, is scheduled to file his nomination from Amethi in Uttar Pradesh on Wednesday. Rahul has reached the Munsiganj guesthouse with sister Priyanka Gandhi Vadra and brother-in-law Robert Vadra. He will lead a roadshow before filing papers at the Collectorate, which has already been decked up. Pakistani prime minister Imran Khan said he thinks there may be a better chance of peace talks with India if Prime Minister Narendra Modi’s Bharatiya Janata Party (BJP) wins the general election, due to begin on Thursday. This admittedly puts the BJP in an unwieldy position as it has often maintained that those who want it to lose are in favour of Pakistan. PDP leader Mehbooba Mufti has said, "Bhakts (are) scratching their heads wondering if they should praise Imran or not," while NC's Omar Abdullah said, "So much for Modi sahib telling the country only Pakistan and its sympathisers want BJP to lose." The nation is a day away from first phase of the greatest democratic exercise in the world — the Lok Sabha election — taking off, on Thursday. While campaigning for the first phase ended on Tuesday, leaders of parties big and small will be busy as ever on the campaign trail on Wednesday. Rahul will begin with a roadshow around 10 am from Amethi's Munshiganj and is expected to reach the Collectorate at noon. His sister and Congress general secretary Priyanka Gandhi is expected to accompany him, as is his mother and UPA chairperson Sonia Gandhi. Rahul is also expected to speak at rallies in Bihar's Katihar and West Bengal's Raiganj later on Wednesday. The Congress has been fielding only its very well-known faces as campaigners this election season. In the Rajasthan star campaigners list released late on Tuesday, for instance, three tell-tale Gandhi family names preceded the names of chief ministers of Congress-ruled states. The only new entrants among star campaigners in the state were new joinees Hardik Patel and Shatrughan Sinha. Uttar Pradesh chief minister Yogi Adityanath has found himself in trouble with the Election Commission once again, for making communal remarks at his Meerut rally. The Meerut District Magistrate will file a report on Adityanath claiming in his speech that the Opposition in Uttar Pradesh believed in "Ali" while the BJP believed in "Bajrangbali". On Tuesday, the last day of campaigning for the first phase of the Lok Sabha election in Chhattisgarh, BJP MLA Bhima Mandavi and four security personnel were killed in an attack on their convoy by Maoists in Dantewada district. Their funerals are expected on Wednesday.